While we were listing the many reasons we don't want another Harper Government, we could have cheated by going here: Not My Prime Minister. Worth a look. Last year around this time, I blogged about Cathy Baskin. Cathy has stage 4 breast cancer. She lives in North Carolina, and she does not have health insurance. Cathy chose to use her personal tragedy to shed light on the US's national, avoidable tragedy, the lack of access to affordable health care. Cathy's husband, Tim Baskin, is a cherished member of our Red Sox community at Joy of Sox. JoS readers know him as SoSock. I bring you this message from Tim and Cathy. My name is Cathy Baskin. I've been married 32 years, have three children, all above the age of 26, and six grandchildren ranging from one year to age 17. In my former life I was an Oncology and Hospice Nurse. In 1996, I was involved in a serious car accident that effectively ended my nursing career. My husband is self-employed, so, as a nurse, I had carried all our health insurance. In 2002, I felt an egg-sized lump in my breast, and went to the doctor. Even though he felt it, too, the mammograms had come back clean, so he decided it was "nothing". He didn't even do a biopsy. I was 44, pre-menopausal, and had fibrocystic breast disease. Taken together, this means mammography results are all but useless. But I had no health insurance, so there was no follow-up. By the following year, the lump had grown: my left breast was almost twice the size of my right. In February 2004, I was finally diagnosed with Stage 3b breast cancer. Drug companies helped me pay for my initial treatments. After six months of chemo followed by radiation, then more surgery, I was clear for about six months. Then the cancer metastasized to my bones. I am now in Stage 4, no longer considered curable. No more help from the drug companies. After my doctor wrote a letter confirming that my cancer is terminal, I was able to get disability benefits and Medicare. This does help, as it covers 20% of my chemotherapy. But 20% of $50,000/month still leaves a lot. We earn $200 more than what Medicaid allows, which means I must pay for most of my Medicare benefits. This leaves $700/month for all our personal and household expenses. I've come to realize that there is nothing I can do about the financial aspect of having cancer, so I don't worry about it anymore. What I do worry about a great deal is keeping our house. Our mortgage payment is only $700/month. We couldn't rent a place in our area for less than that. My husband's work van has almost 400,000 miles on it. We have spent more than $600 worth of repairs on the van this month alone so that he can continue to work. I spent the better part of August and September in the hospital. The very day I came home, my car's transmission crashed. Now I am stranded. There is no way I can afford to fix it, nor would that even be wise, as the car would still need another $500 to $1,000 in other repairs. So now I must find friends who can drive me to my doctor appointments and chemotherapy sessions. I feel stuck. What little control I thought I had has gone up in smoke. Please help me raise the $4000 we need to get a decent used car. If I were being asked to donate money, I would want to check out the truthfulness of the story. So please feel free to visit my website. Think of what a difference your very small donation can make. If 330 people donate only $10 each, Cathy can get her car. By using Fundable, you pledge a donation. Your pledge only becomes a payment if and when this collection reaches its goal. If Cathy doesn't meet her fundraising goal, you pay nothing. Let's make this happen. Click here to make a pledge. From CBC: Liberals accuse Harper of plagiarizing 2003 speech on Iraq. The progressive Canadian blogosphere is all over this. Go to Progressive Bloggers for many perspectives. Best way to search: go to the Affiliates pages and scroll down through the numbered pages. A personal note about going to see Naomi Klein last night. First, I heard about the event through a comment on this blog. This is cool. Then, waiting to get in and afterwards, I saw some great people I know through the Toronto activist community. This is very cool, and for me, it's a bit amazing. And afterwards, Allan and I went to a pub, which is something I so love about Toronto: great pubs everywhere. It's very different from New York, in a good way. These are the kinds of things that make me very happy, perhaps out of all proportion to what happened. It's a deep-down happiness of feeling so grounded and at home now. Allan and I went to hear Naomi Klein speak at Bloor Cinema last night. Thanks to a tip from friend of wmtc Lisa (yay! ), I learned about the event before it sold out. The place was packed (850 people) and hundreds more were turned away. Klein is a terrific speaker. She has such a beautifully relaxed, warm presence, she's so articulate, and her knowledge is truly impressive. Not every writer is also a good speaker and organizer, but she is all three. The event was a fundraiser for the native communities of Tyendinaga Mohawk Territory and the Algonquins of Barriere Lake. Some Toronto activists spoke about that, but Klein addressed our current social shock: the crisis of capitalism that is unfolding in North America right now. Klein began by noting that in this famously ahistorical, even anti-historical society we here in North America live in, the US Congress saying "NO" to the massive transfer of funds means we actually managed to remember something. 95% of the US public opposed this so-called bailout, and Congress actually acted on their wishes. A democracy moment. Klein then gave a historical perspective on what's happening, which is exactly what we all need. Roosevelt draws a compromise between socialism and corporatism, displeasing both sides - Klein quotes from Upton Sinclair's angry letter to FDR - but saving capitalism's bacon by restraining it. By regulating it. In our era, said Klein, we have been living through a massive liberation movement: capital liberating itself from those restraints. Reagan, Thatcher and Mulroney went about dismantling those barriers to unchecked profit-making - those regulations that protect people, labour, the environment. Remember, corporations are designed to create profit. That's their sole raison d'etre. It's not the corporation's job to say, we shouldn't gamble with people's life savings, we shouldn't destroy the environment. Its only function, its mandate, is to create profit. The more profit a corporation creates, the more successful it is. It's government's job to restrain those profit-making corporations, to create limits and protections, so that they cannot trammel over what is not theirs. These limits and protections ultimately end up helping corporations, too. Nobody was buying cars during the Great Depression. Society needs to be healthy if people are going to be good consumers. So, Klein says, this massive liberation movement that began under Reagan, went unchecked through Clinton (I appreciated that! ), and of course picked up renewed speed under the Bush junta, has been enormously successful. For 35 years we have been living through a counter-revolution, a "great unmaking" of all those gains that were so painstakingly fought for before and after the Great Depression. I really appreciated this perspective, because too many progressive people don't seem to realize it. Too many USians and Canadians imagine that this era of unchecked capitalism began with Bush II and Harper in Canada. They imagine that during a Democrat administration or Liberal Government, there was increased regulation and protection. Check your history. Klein's central metaphor - the shock doctrine - says that one of the most powerful tools of this capitalist counter-revolution is to create (or at least exploit) a crisis. A crisis exists when we suddenly find ourselves in unfamiliar territory. We have no narrative to explain and guide us through the difficult and scary times. We panic. Our panic is their opportunity. The counter-revolutionaries swoop in with their own narrative, and they tell us what needs to be done. It's crisis as a giant democracy-avoidance tool. The crisis of 9/11 brought us the USA Patriot Act. It was hundreds of pages long, and written mostly under Clinton. (Not "conspiracy theory". Fact.) The crisis of 9/11 let an unelected government bring in massive unconstitutional changes without discussion, debate or even public knowledge of what the changes were. The crisis of 9/11 brought us the war in Afghanistan and Iraq. Domestic surveillance, Guantanamo, the Military Commissions Act, and on and on. Now they want to use this new manufactured crisis - itself caused by deregulation and unchecked capitalism - as a springboard to another great leap forward in this great unmaking. Klein related some of Linda McQuaig's excellent work, in her book Shooting the Hippo, when McQuaig interviewed the person responsible for Moody's credit ratings. Canada had always had a triple-A rating, A++. Canadians were scared into believing if they didn't have NAFTA, if they didn't merge their economic interests with those of the US, the country's credit rating would plummet and no country would want to do business with them. In her research, McQuaig learned that Canada was the only country where corporate interests would beg Moody's to lower the country's credit rating. Business leaders in other countries would try to convince Moody's that their country's credit was better than it was, to get a higher rating. Canadian corporate interests wanted the credit rating lowered, so they could prove that regulation, social spending, and caring for the public trust (i.e., higher corporate taxes) were indeed scaring investors away, making Canada less stable economically. Too bad it doesn't work that way. Now Harper will use this economic crisis as a way to frighten people into believing they need a "strong leader". (Klein compared this to post-9/11 Giuliani.) Harper, Klein said, will use this economic crisis to try to dismantle everything that's worth saving about Canada. In the US, the crisis may be used for something even worse. Naomi Klein didn't say that. I did. The two bits of Friedman that Klein has made most famous are these. The quotes are Friedman according to Klein. "Our basic function [is] to develop alternatives to existing policies, to keep them alive and available until the politically impossible" - radical deregulation, mass privatization, deep cuts to social spending - "becomes the politically inevitable." And: "Only a crisis, real or perceived, produces real change, and when that crisis hits, the change that occurs depends on the ideas that are lying around.". Klein reminded us that an economic crisis caused by deregulated capitalism is a "naturally progressive moment". It's the time when our ideas shine the brightest - when the failure of unchecked capitalism is most apparent, and people need an alternative. There's a reason that socialism was so popular after the Great Depression, and why bits of socialist ideas became embedded in the capitalist system. During this crisis - this moment of panic, when people lack a familiar narrative to ground them - is the time we most need to speak out: this didn't have to happen, and there is a better way. We must become "shock resistant" by having our own ideas, our own narrative, on hand, lying around, ready to act. A mere five years ago, no one running for political office in Canada or the US would have talked about climate change. It wasn't an issue. Now people vie for our votes with dueling climate-change plans. We did that. People in Canada, people the world over demanded that climate change and the environment become a political issue. Now it is. Occasionally, Klein noted, we get a "weird outbreak of democracy". Let's use it. "Following" blogs is not working for me. Blogger's "Blogs I'm Following" function shows up on your dashboard page. I go to the dashboard a zillion times a day to check for comments awaiting moderation, for both wmtc and Joy of Sox. Now when I do that, all the things I should or could be reading are staring me in the face. You can't change the default tab to Blogs of Note or Blogger Buzz. It's always the Following feed. Seeing Blogs I'm Following a zillion times a day is contributing to my ever-present feelings of being overwhelmed, and the energy it takes to focus and manage my time. I need to return to my previous method of keeping track of people's blogs, through feeds on my iGoogle page, which I only see when I choose to see them. So, dear everyone whose blog I am following, I am removing myself from your Following list. Not because I am no longer interested in your blog, and not because I will read your blog any less frequently. Trust me. It's a sanity thing. Way back here, I asked for gadget help. Then I postponed buying anything, as I've been so pressed for time, and I know that anything new requires time, especially if it's going to sync with my home computer via new software. So I decided to wait. Now, one week from deadline, I'm anticipating more time on the horizon, so I'm starting to think about the phone again. (It looks like I'll have more writing work related to Spinal Network, but the huge project I've been working on since early July is coming to a close.) And I'm thinking myself in circles about this phone thing. I really want a qwerty keyboard for texting. Although I don't text often, I do find it very useful, and I would text a lot more often if I didn't have to pick through my stupid alpha-numeric keyboard. I know many people like T9 but I find it maddening and useless. As I looked through my qwerty-keyboard options, I saw this phone, a "Rumour" from LG. (Doesn't it seem like I should own a piece of LG?) I really like the look, but Rogers doesn't have it. I'd have to switch to Bell in order to get the phone thrown in the deal. Do I want to change providers? I find Rogers super-easy to deal with. (Don't laugh! I really do). Any time we travel or I go to the US, I add on long-distance or US minutes for only that month. And since our we have cable and internet through Rogers, too, there's a discount. Do I want to take a chance on a new provider? Not really. But do I want to stay with Rogers so much that I spend $300 on a phone? No. If I give up on the Rumour phone, and stay with Rogers, and I want a qwerty keyboard, I'm looking at a Blackberry. If I get a Blackberry, I'll have mobile email. And I don't really want my email following me around. I'm at my computer practically all day and all night. When I'm away from it, I want to be away from it. What's more, I would have to pay for that, right? There is just no way I can afford another monthly bill. I'm earning about half of what I was earning in 2006. Allan's earning slightly more, but the net result is way down. And even if I could afford it (which I can't), I don't want more expenses. I already wish we could simplify more, and we can't seem to. No need to add anything else to the pile. But if I don't get mobile email, can I get an organizer that will sync with my computer? I've had that for so long, it would be strange to be without. Allan thinks I could wean myself away from it and eventually not miss it. So now I'm coming around the other side. Maybe instead of ramping everything up, I should just get a new phone, not a pda, not a Blackberry, just a phone. There is also this phone, a Samsung SCH-u740, which has a double hinge, for talk or text. Rogers doesn't have it, but it's inexpensive. I can't spend $300 for a phone Rogers doesn't have, but I can spend $30. Or should I just give up on the qwerty? Get a cute little phone and pick my way through text messaging the way I do now? And can I give up a pda? I'm still vacillating. And a tangential question, if I don't sync with a handheld device, how do I back up my Outlook data? At least I've ruled one thing out. Higher monthly bills just to have mobile email and a data stream I don't need is out of the question. คาสิโนออนไลน์ แจกเครดิตฟรี 2019PeterC: First deficit in many years. Conservative track record at managing the economy poorly. I think those fit under poor economic management no matter what sweater vest says. democratic space is making me feel better. a little. There's been a lot of dialogue in the Canadian progressive blogosphere about strategic voting, whether it's more important to vote for something (vote your conscience) or to vote against something (vote for the non-Harper candidate most likely to win). For me, Idealistic Pragmatist's post on the subject says it all. She's even saved me the trouble of gathering the top links from the different perspectives. Please go read her excellent post: My two cents on strategic voting. If work is slow this weekend, I will gather all the comments and links from this thread and promote it to a post. So this is your last chance to finish the sentence, "We don't want another Harper Government because...". That is, your last chance until the post goes up and people leave comments there. From an email from James Branum, Robin Long's lawyer, to Robin's supporters. I found out that Robin has moved to Miramar Naval Consolidated Brig near San Diego (the Army is running out of space to put all of their AWOL's and Deserters). More info on mail, visitation, etc. is here. Also someone earlier sent Robin an amazon gift card at the jail, which would have been great except they don't have internet access at the jail. In the future, if folks want to just buy him amazon credit, then send the card either to me or to Courage to Resist and we'll buy books for Robin with it and have them shipped to him. Lastly, I'm going to travel to San Diego later this month to visit Robin and possibly put together a support protest in the area. I'll be in touch soon with more details. P.S. Please pass Robin's address on to folks who would write him. And an old update from James Burmeister's support team. It has been some time now since our last update on James and this is due only to the fact that things move slowly when one is on the inside. As many of you may already be aware, James has been held in a medium security military prison on AWOL charges since his Special Court martial,, which took place at Fort Knox (KY) on July 16th. James was given a 6month sentence and a bad conduct discharge. News from James has been sparse. He tries to be in touch with his family when he can. Those of you who know James or who have had the fortune of meeting him will be happy to hear that his strong character, his patience and honestly are all serving him well as he awaits the end of his sentence. James was adamant about his resolve to not commit war crimes and take part in actions he deemed to be unnecessary, illegal and immoral. He was well aware that his non-compliance with orders may complicate his life and end his military career but this was a price James was willing to pay if it meant not promoting unnecessary violence and inhumane acts. James was caught in a firestorm of controversy for having been outspoken with the media and we believe this to be part of the reason for the severe steps the military ended up taking against him. James voluntarily turned himself in to the gates of Fort Knox earlier this year, on March4th and since that date has gone through unimaginable challenges to progressively put this experience behind him. James continues to suffer from PTSD. He is in a 15-person cell. He continues to have difficulties sleeping and has taken on shifts of labour to stay occupied and show good behaviour. He works long shifts every week, either dish washing or doing janitorial duties. He has a few odd health ailments due to the lack of easy medical attention but he is hanging in there overall. James can receive mail and loves to hear from everyone. He has received much mail already and these letters continue to give him the encouragement he needs to pull through. -please do not include anything but the paper you yourself have used to write. -do not send stamps, envelopes, writing paper, stickers or anything other than a simple letter. There are very strict rules about what inmates can and cannot receive. Anything more will not make its way to James. We also know that James' Defense Counsel is preparing a Clemency package to represent James' case to the Commander and see whether or not a softening of the sentence and discharge is possible. This is a standard procedure in a case like this, but our hopes are very realistic and as such, barely there. Still, all of you who have submitted important letters in support of James' clemency, we sincerely thank you. They have all been received and are now in the hands of James' attorney. The next logical step, should James not obtain Clemency, would be to proceed to the Courts of Appeal. I am not sure if this is something that James, his family or appellant lawyer will suggest or want to carry on with. I will try to keep you all posted as details emerge. In the interest of not going on too long, I will cut it at that. Thanks again to all of you, you know who you are, for your words of support, your letters, your time. We expect James to be released before the new year. I'm sorry that it took me so long to post this. I'm going to write them both this weekend. Tonight, September 26, Stephen Harper is in Toronto. Why: Many reasons, but for now, for me, the message is "Stop The Deportations". By Public Transit from Toronto: Subway westbound to Islington station, then #50 bus on Burnhamthorpe towards Martin Grove. Bus leaves every 15 minutes. Ride will be about 10 minutes. We won a big victory, with the Federal Court staying the removal of Jeremy Hinzman and his family. But another war resister family waits in the wings, and after that, another and another and another, all potentially facing the threat of deportation if Harper continues to ignore democracy by refusing to implement the June 3rd motion. Also, it's interesting that neither of the local newspapers here had any firm info about the Harper visit, just that he is "expected" or that local Conservatives "have been advised" that he will visit but that few or no details were available. There are no further details on the newspaper websites either. This morning's paper, for example, has this headline over a small item on the front page "Harper visit coming today?" (note the question mark) with the statement that "No confirmation was given from the local Conservative office about the visit." "Security issues" were cited for all this secrecy. Guess they don't want anyone showing up except the party faithful. They'll be very disappointed, won't they? From Impolitical: Michaelle Jean sought the repatriation of Omar Khadr from Guantanamo Bay. A report in La Presse today that the Governor General asked Harper to seek the repatriation of Omar Khadr from Guantanamo Bay. Apparently this happened after the videotapes of Khadr being interrogated were released. Further, Jean consulted with legal advisors prior to consulting Harper. In response to her request, Harper, it is reported, stated that his caucus and the base of his party would never accept it. Which, if all this is being reported accurately, would just confirm that such significant decisions made by Mr. Harper are not taken in the interests of the Canadian nation nor having regard to the relevant legal considerations that are involved. What Mr. Harper apparently disclosed to Jean about his decision making calculus were purely partisan considerations that would properly be irrelevant when making a decision about our foreign policy and more importantly, about the fate of a Canadian citizen. It's a very damning disclosure about the Prime Minister. Many thanks to Impolitical (and Progressive Bloggers); I would have missed this. About two weeks ago, I blogged about Anthony Davis, a man on death row in Georgia (US). Davis has been on death row for 15 years, and is almost certainly innocent. At the very least, there are huge questions surrounding his conviction. He was scheduled to be executed in three days when the ACLU began a huge public-outreach campaign, in addition to petitioning the US Supreme Court in his defense. For more details about Davis's case, please go back and read this post. Here's the latest from the ACLU. Rarely have the actions of ACLU supporters like you made such a powerful and tangible difference as they have in the life of death row prisoner Troy Davis. Over the past two weeks, tens of thousands of ACLU activists have demanded justice for Troy. Without that outcry, a man who is most likely innocent may well have been killed by the State of Georgia without any court ever hearing the compelling evidence of his innocence. Yesterday, in a dramatic turn of events, the United States Supreme Court saved Troy Davis's life just two hours before his scheduled execution. His fate is now in the hands of the Supreme Court. They’ve stayed his execution. But, unless they now decide to hear his case, that stay will soon be lifted. And then only Georgia officials can stop his execution. Troy Davis's case is far from unique. Sadly, it is a very public demonstration of what can go wrong when courts and legislatures use procedural barriers to block persuasive claims of innocence and other constitutional violations. And he is only one of the thousands of others on death row. We must increase the public outcry. Write a letter to the editor now. 130 innocent individuals have been released from death rows across this nation after having been wrongfully convicted. Will Troy Davis join the ranks of the other men and women who have been killed by the state in spite of compelling evidence of their innocence? We must increase the public outcry about the death penalty -- and you can help. Write letters to the editor. Call your local radio station. Post your personal call for justice on blog sites. Do everything you can to highlight this case and the fundamental unfairness of the death penalty. Keep the public pressure on. If we want an America where we don't need the highest court in the land to have to step in to stop innocent people from being put to death, we all have to get involved. Don't let it happen. Not to anyone. Help bring the plight of Troy Davis to public attention and save the lives of innocent Americans on death row around the country. I can think of no greater injustice than the execution of an innocent person. I can think of no greater intrusion of the state into lives of citizens - no greater violation of bodily integrity - than the state being allowed to kill a citizen. I didn't think I could do much to help save Anthony Davis's life, but it seems like what little we can do may be working. The ACLU is making it very easy. Click on this link to write a letter to a newspaper. Naomi Wolf asks, "Has Sarah Palin Been Picked as the Titular Head of the Coming Police State?". A lengthy excerpt follows. This is easily dismissed, but should not be. And in Canada, we have to make sure our country stands as a free nation, an altnerative to the fear nation to our south.
. . . You have to understand how things work in a closing society in order to understand "Palin Power." A gang or cabal seizes power, usually with an affable, weak figurehead at the fore. Then they will hold elections -- but they will make sure that the election will be corrupted and that the next affable, weak figurehead is entirely in their control. Remember, Russia has Presidents; Russia holds elections. Dictators and gangs of thugs all over the world hold elections. It means nothing. When a cabal has seized power you can have elections and even presidents, but you don't have freedom. First, read Margaret Atwood's beautifully strong and clear defense of "ordinary people" and the arts in today's Globe and Mail. But we've just been sent a signal by Prime Minister Stephen Harper that he gives not a toss for these facts. Tuesday, he told us that some group called "ordinary people" didn't care about something called "the arts." His idea of "the arts" is a bunch of rich people gathering at galas whining about their grants. Well, I can count the number of moderately rich writers who live in Canada on the fingers of one hand: I'm one of them, and I'm no Warren Buffett. I don't whine about my grants because I don't get any grants. I whine about other grants - grants for young people, that may help them to turn into me, and thus pay to the federal and provincial governments the kinds of taxes I pay, and cover off the salaries of such as Mr. Harper. In fact, less than 10 per cent of writers actually make a living by their writing, however modest that living may be. They have other jobs. But people write, and want to write, and pack into creative writing classes, because they love this activity – not because they think they'll be millionaires. When you're finished reading, think again about the "why we don't want another harper government" thread. We've covered arts and culture budget cuts, but I'm sure we haven't yet covered everything else. On October 1 and 2, the leaders of five Canadian political parties will participate in a televised debate. You can submit questions for any of the leaders by sending an email to question@electiondebate08.ca. Mr. Harper, on June 3, the House of Commons passed a motion calling on the Government to stop all deportation proceedings against US war resisters and implement a motion allowing them to stay in Canada. All three opposition parties united to pass this motion. In 2005, referring to the Paul Martin Government, you said, "The Prime Minister has the moral responsibility to respect the will of the House." As head of a minority government, don't you have that same moral responsibility? How can the head of a minority government not follow the clearly stated will of the majority? Courtesy of James, Jillian at Sadly, No! has figured out the solution to both the US and Canada's problems: Buy A Progressive. We're clearly unwanted in the US and badly needed here in Canada. There were many amusing schemes like this on the internet in 2004, including a movement to make Vermont Canada's 11th province. I especially love Sadly, No! 's reference to the monorail, one of The Simpsons' finer moments. You may remember I've blogged about the plight of wolves in the US: they were going to lose protected status, then the US did "de-list" the wolf from the Endangered Species Act. The slaughter began immediately, and got worse. 110 wolves were killed outright, and others surely starved to death when the animals they depended upon for food were exterminated. In July, a US judge restored the wolf's protected status: a major victory. Last March, the Bush Administration declared the Northern Rockies' wolf population "fully recovered," then it handed off responsibility for the wolves to Wyoming, Idaho and Montana. Just as we predicted, a bloodbath ensued, with 110 wolves slaughtered by state agents and hunters in as many days. NRDC, Earthjustice and 11 other conservation groups raced to court and won an injunction that put a temporary halt to the killing until the full case could be heard. We fully expected to fight a drawn-out courtroom battle in order to win a permanent victory. But thanks to the Bush Administration's surrender, that battle will NOT happen. 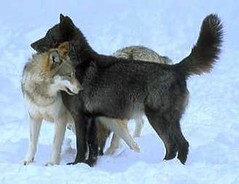 Instead, the wolves of Yellowstone and the surrounding region will remain protected by federal law. That means Wyoming, Montana and Idaho will NOT be allowed to begin the extermination of hundreds of wolves this fall as part of a massive public hunt -- the first in more than three decades. 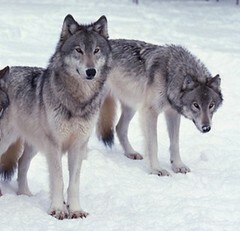 Instead, those wolves will continue to roam the Rockies -- wild and free -- as nature and the law intended! Why did U.S. Fish and Wildlife officials throw in the towel? They had to face up to the fact that their case against wolf protection would never hold up in court. Above all, they ignored the best available science showing that wolf populations had not fully recovered. In the end, the Administration had little choice but to put its tail between its legs and beat a hasty retreat. Make no mistake: the fight doesn't end here. You can be sure the federal government will be back soon enough with a new plan. 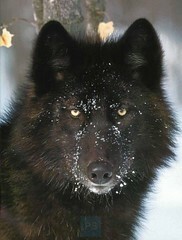 And the states will learn their lessons and return with yet another scheme for killing wolves. But you can be equally sure that, with your help, NRDC will stand vigilant, fully prepared to meet and turn back any new and deadly threat. In the meantime, please join me and all of us here at NRDC in celebrating this red-letter day in the storied history of the Endangered Species Act. It happened because you and thousands of others chose to stand up in defense of embattled wildlife. Thank you! It's nice to celebrate a victory now and again. More photos on some of the earlier posts, linked above. The US Government has seized control of the largest, most powerful insurance company in the country, along with the entire mortgage industry and large portions of the financial services industry. The US Army is in training for domestic operations. The Republican candidate for president suspends his campaign. And all this must be seen in context of a Government that has been systematically expanding its powers and operating as an autocracy, a Government that was not elected by popular vote in the first place, then fixed elections to maintain its power. I've been amazed - dismayed, horrified - as progressive people cheer on Obama seemingly without a thought to this context, as if the peaceful transfer of power from one party to another, based on a fair election, is a certainty. When that's not what we've seen for the past two elections, and nothing has been corrected. And those in power have continued to shut down the Constitution. In the history of civilization, has any powerful group of people consolidated and expanded their power, shut down and/or falsified all legal avenues of opposition, then willingly and peacefully handed over power to others? Last night we were watching the Red Sox with our laptops in front of us. I saw the headline "McCain Suspends Campaign" in my CBC feed, and my heart froze. I read it to Allan and we looked at each other in shock. What is happening? I fear my fears are coming true. There is nothing like walking in the woods to clear my head. Swimming makes me feel much better, too, but this brain-fry was too big for the Mississauga Y.
I found this very good resource: Toronto Hiking. It has a list of hikes in and around the Toronto area, and a separate list of waterfalls along the Niagara Escarpment. There are detailed descriptions of each hike, so you can judge in advance the terrain, degree of difficulty, or whatever features are important to you. Every hike is linked to a road map, a trail map, photos and other info. Although all the Ontario parks and conservation areas have good websites, I haven't found a good way to judge the appropriateness of any given area until we're there. We're not into climbing, and we have a senior dog to think about, so if we feel like a nice long walk in the woods - as opposed to just getting out in the country - it's nice to be able to plan. Yesterday we went to Hilton Falls, part of the Conservation Halton system. It's a beautiful area, with several overlapping loops (none very strenuous) and a small waterfall. At the falls there are remnants of an old mill that was constructed around it in the 1840s. It may have been a stop on the Underground Railroad... or not. The park is a big destination for mountain biking and cross-country skiing, too. I love how the Escarpment forms these little waterfalls all over the area. I never knew about the Escarpment before I moved to Ontario, although I've intersected with it several times before. Most famously, of course, through Niagara Falls. Imagine the little Hilton Falls we saw yesterday is related to the mighty falls of Niagara. But I've apparently encountered the Escarpment at the Genesee River in Western New York State, where it forms waterfalls and gorges, and through the New York State town of Lockport. I knew a series of locks were built there for the Erie Canal - I love my New York State history - but I didn't know they were needed to get the Canal over the Niagara Escarpment. In general, I'm still amazed at how quickly you can reach farmland in this area, how the sprawl ends like a knife edge and "the country" begins. In the New York metro area, you have to drive much greater distances to find the country (although there are pockets of country within the city and suburbs, same as the Greater Toronto Area). Here, you can practically see the sprawl pushing at the farmland in place like Oakville, Milton and other towns. Hilton Falls is really very nearby, which is nice when you have a barking, spinning dog in your car. Tala barked the entire way there, walked around 10 kilometers, barked most of the way back, then wanted me to throw her ball in the backyard. Allan and I are much more like Cody. She's content to relax in the car, go for a walk, then return to relaxing. Bring friends, bring signs, bring your voice. Come early, stay late, have fun. Vancouver: Remarks and media availability, 9:30 a.m., Oceanview Suite, Pan Pacific Hotel, Suite 300, 999 Canada Place. Courtenay, BC: Rally, 6 p.m., Westerly Hotel, 1590 Cliffe Avenue. As you may have noticed yesterday, I'm feeling a little fried. I'm taking the day off, and we're heading out with the dogs for some hiking on a glorious autumn day. Some of our hikes have ended up more driving around and exploring towns than hiking, which is fine if it works out that way. Last month (on my once-monthly goal) I was too busy to plan, and we just walked on a local stretch of Waterfront Trail. Today should be a real hike in a new location. But you never really know. And guess what happened last night? The Red Sox clinched the wild card! We're going to the playoffs again. Further to my last post, James has sent me this, from Democracy Now!. It can be very hard to focus on what's happening in the world. There's a lot of it, and it comes at us from all sides and all angles, and we're already trying to focus on our own lives, and if those lives are very busy, the whole thing can turn into an overwhelming noise. My mind has felt overloaded lately. Overloaded with my own work, and my desire to help the war resisters, and the political situation in Canada. Baseball playoffs are about to start, and I'm usually completely obsessed by now, but right now I barely think about baseball unless I'm watching a game. This is not my preferred mode of being. But I focus on issues and events more than most people, as, probably, do you. I don't have children, and I'm a very political person, which compels me to keep up with current events to the extent that I can. How do people whose lives are taken up with work and children, who don't necessarily have political priorities, keep up? How do people who are struggling with their health, or with trying to figure out how to keep children clothed and fed on their Wal-Mart paycheque, keep up? At best, they get a vague sense of things from a mainstream media outlet. That sense of things has been reduced to tiny, predigested sound bites, it mixes local "human interest" stories with major world events, it offers no context, and it doesn't represent the many forces effecting the person's life and their future. At worst, they tune out altogether, exchanging news for celebrity gossip. Wmtc has a lot of new readers now, so you may not be familiar with my sense of what's going on in the US. You may have the mistaken impression we left the US "because of Bush". Sometimes people still ask me about absentee ballots, or want to talk about Obama. I just shrug. I'm done. I've checked out of that system. I can't participate in it anymore. It's too corrupt, too bankrupt. It's broken beyond repair. But it's beyond that. Two presidential elections were stolen, 2000 and 2004. Massive questions surround the midterm elections of 2002 and 2006. And nothing has changed. No, that's not true. It's gotten worse. So why would the 2008 election be fair? I'm not trying to prevent anyone from voting. I'm just doing what I feel I must. Several people have told me that if anyone will fight for a fair election, it's Barack Obama. I don't know why that would be true, why "this time it's different" makes any more sense now than the last 50 times the Democrats slammed their dutiful abused wives - the voters - against the wall. But if it's true, it will be an unprecedented wonder, and I'll cheer it all the way. Beyond fraud - which is a big thing to be beyond - I'm actually unconvinced there's going to be an election in the US. If I'm wrong, I'll be inexpressibly relieved. We didn't leave the US because of Bush. We left the US because we don't think it's a democracy any more. I'm writing this off the top of my head, in the middle of my work day. My blogging is usually very methodical - I often know the subjects of my next three or four posts in advance - but right now I'm just banging out my thoughts. Maybe later I'll go back and add links. For now, you can click on the categories "fascist shift", "election fraud" and "US regression" for that. What brought all this on? The US financial crisis, the "bailout" and Glen Greenwald. Who in the US can focus on this? What ordinary person can understand it, let alone complain about it? Who would they complain to and what would happen? And besides the overwhelming realities of everyday life, the quadrennial circus is in town. How can anyone hear anything else above the din? My friend and long-time wmtc commenter James sent me a piece from Good Math, Bad Math, written by Mark Chu-Carroll, part of ScienceBlogs. Chu-Carroll attempts to explain what's going on to the non-economist, which is most of us. Here's an excerpt from the end of his post. Once upon a time, banks had to keep the bank money (i.e., deposits) separate from other things. In fact, they had to keep the entire business of banking separate from the investment business. There were rules about what they could invest in. And so on. All of this was torn down by the conservatives in our government. And as new financial products came onto the market, instead of making rules to make sure that people were being fair and honest, they insisting on maintaining a strict hand-off policy. Free markets are great things. But the big catch is that like anything else run by human beings, they're easy to abuse if you're not honest. The purpose of regulation is to try to limit the kinds of abuse people can get away with. If someone sells you an investment and tells you that your principal is absolutely safe, then damn it, it should be safe. If it's not, they should be required to tell you what the risks are. But for now, they don't. There's no legal framework for creating or enforcing rules. No one can be punished for the damage they've done. No one loses the huge rewards that they pocketed by screwing people over - because there's no rules, no legal mechanism, that says that they can't. As I'm finishing this article, I just came across a news story. Lehman Brothers is one of the big investment firms that was involved in this. They were forced into bankruptcy as a result. As they're starting to liquidate and sell off their assets, we learn that one of the last things they did before filing for bankruptcy was setting aside two and a half billion dollars for performance bonuses for the staff of the New York office. The very people who put the firms money into worthless investments, who ran a hundred year old company into the ground, made sure that before they filed for bankruptcy, they squirreled away more of their investors money to pay themselves bonuses. And that's legal - they can take that money out of the pool of liquidated assets to pay themselves, instead of leaving it to pay back the people who are owed. Then read this, by Glenn Greenwald. Greenwald opens with a series of quotes, which I'll skip, but you might want to go back and check the original. I'm using the Common Dreams link because a lot of people have trouble accessing Salon. First, the fact that Democrats are on board with this scheme means absolutely nothing. When it comes to things the Bush administration wants, Congressional Democrats don't say "no" to anything. They say "yes" to everything. That's what they're for. They say "yes" regardless of whether they understand what they're endorsing. They say "yes" regardless of whether they've been told even the most basic facts about what they're being told to endorse. They say "yes" anytime doing so is politically less risky than saying "no," which is essentially always and is certainly the case here. They say "yes" whenever the political establishment -- meaning establishment media outlets and the corporate class that funds them -- wants them to say "yes," which is the case here. And they say "yes" with particular speed and eagerness when told to do so by the Serious Trans-Partisan Republican Experts like Hank Paulson and Ben Bernake (or Mike McConnell and Robert Gates and, before them, Donald Rumsfeld and Colin Powell). So nothing could be less reassuring or more meaningless than the fact that the Democratic leadership has announced that what they heard scared them so much that they are certain all of this is necessary -- whatever "all this" might be (and does anyone think that they know what "this" even is?). It may be "necessary" or may not be, but the fact that Congressional Democrats are saying this is irrelevant, since they would not have done anything else -- they're incapable of doing anything else -- other than giving their stamp of approval when they're told to. Second, whatever else is true, the events of the last week are the most momentous events of the Bush era in terms of defining what kind of country we are and how we function -- and before this week, the last eight years have been quite momentous, so that is saying a lot. Again, regardless of whether this nationalization/bailout scheme is "necessary" or makes utilitarian sense, it is a crime of the highest order -- not a "crime" in the legal sense but in a more meaningful sense. And all of this was both foreseeable as well as foreseen -- see the 2002 grave warnings from Warren Buffett on pages 14-15 of his shareholders letter (.pdf), among many other things -- and it's also happened before, when the Federal Government bailed out the S&L industry that (with John McCain's help) was able to gamble recklessly and then force the country to protect them from their losses. The people who did this have no fear of anything -- they completely lack the kind of healthy fear that impedes reckless behavior -- because they know how our Government works and that they control it and thus believe that their capacity to suffer is limited in the extreme. And they're right about that. What's most vital to underscore is that the beneficiaries of this week's extraordinary Government schemes aren't just the coincidental recipients of largesse due to some random stroke of good luck. The people on whose behalf these schemes are being implemented -- the true beneficiaries -- are the very same people who have been running and owning our Government -- both parties -- for decades, which is why they have been able to do what they've been doing without interference. They were able to gamble without limit because they control the Government, and now they're having others bear the brunt of their collapse for the same reason -- because the Government is largely run for their benefit. If there is any "pitchfork moment" -- an episode that understandably would send people into the streets in mass outrage -- it would be this. Nobody really even seems to know how much of these losses "the Government" -- meaning working people who had no part in the profits from these transactions -- is undertaking virtually overnight but it's at least a trillion dollars, an amount so vast it's hard to comprehend, let alone analyze in terms of consequences. The transactions are way too complex even for the most sophisticated financial analysts to understand, let alone value. Whatever else is true, generations of Americans are almost certainly going to be severely burdened in untold ways by the events of the last week -- ones that have been carried out largely without any debate and mostly in secret. Third, what's probably most amazing of all is the contrast between how gargantuan all of this is and the complete absence of debate or disagreement over what's taking place. It's not just that, as usual, Democrats and Republicans are embracing the same core premises ("this is regrettable but necessary"). It's that there's almost no real discussion of what happened, who is responsible, and what the consequences are. It's basically as though the elite class is getting together and discussing this all in whispers, coordinating their views, and releasing just enough information to keep the stupid masses content and calm. Can anyone point to any discussion of what the implications are for having the Federal Government seize control of the largest and most powerful insurance company in the country, as well as virtually the entire mortgage industry and other key swaths of financial services? Haven't we heard all these years that national health care was an extremely risky and dangerous undertaking because of what happens when the Federal Government gets too involved in an industry? What happened in the last month dwarfs all of that by many magnitudes. The Treasury Secretary is dictating to these companies how they should be run and who should run them. The Federal Government now controls what were -- up until last month -- vast private assets. These are extreme -- truly radical -- changes to how our society functions. Does anyone have any disagreement with any of it or is anyone alarmed by what the consequences are -- not the economic consequences but the consequences of so radically changing how things function so fundamentally and so quickly? It's fascinating to watch how easily consensus is manufactured. A few days ago elite opinion seemed to be cheering Paulson's "no bailout" line, and now they're cheering a trillion bucks thrown down the crapper. All the Very Serious People will spend their days coming up with their pony plans, oblivious to the fact that the pony plan is not an option. The Bush administration's plan is the option. The way it works is that Bush officials decree how things will be, and then everyone -- from Congressional Democrats to the Serious Pundits -- jump uncritically and obediently on board, even if they were on board with the complete opposite approach just days earlier, and then all real dissent vanishes. That's how the country in general works. As Atrios says: "We've seen this game played before." I don't pretend to know anywhere near enough -- in terms of either raw information or expertise -- in order to opine on the necessity or lack thereof of The Latest Plan in terms of whether the alternatives are worse. But what I do know is that an injustice so grave and extreme that it defies words is taking place; that the greatest beneficiaries are those who are most culpable; and that the same hopelessly broken and deeply rotted institutions and elite class that gave rise to all of this (and so much more) are the very ones that are -- yet again -- being blindly entrusted to solve this. UPDATE: Here is the current draft for the latest plan. It's elegantly simple. The three key provisions: (1) The Treasury Secretary is authorized to buy up to $700 billion of any mortgage-related assets (so he can just transfer that amount to any corporations in exchange for their worthless or severely crippled "assets") [Sec. 6]; (2) The ceiling on the national debt is raised to $11.3 trillion to accommodate this scheme [Sec. 10]; and (3) best of all: "Decisions by the Secretary pursuant to the authority of this Act are non-reviewable and committed to agency discretion, and may not be reviewed by any court of law or any administrative agency" [Sec. 8]. Put another way, this authorizes Hank Paulson to transfer $700 billion of taxpayer money to private industry in his sole discretion, and nobody has the right or ability to review or challenge any decision he makes. And finally, a link from Allan, a piece by Larisa Alexandrovna, who agrees with Naomi Wolf: it's the end of America. Welcome to the Final Stages of the Coup. paralympics fever: i succumb. a little bit. dylan penner: harper's "mean shift"